Anything that didn’t fit the other page categories goes here. Here’s Dave’s Tracking Page chock-full of direct links to various common-carrier trucking firms that frustratingly don’t provide home-page links to their own shipment tracking pages. My take on Camper’s Paradise near Nevis, MN where we have vacationed for many years. I created my page because they didn’t have their own until a few years ago. We saw a Toga Party in 2008, sort of an early version of a flash mob. In 2010 the group provide their idea of “Politically Incorrect Cowboys and Indians“. I don’t know the back story on this group except they seem to hang out at the same set of campsites each year, near the eagle’s nest, and put on a walk-around show dressed up pre-defined garb for about an hour each year. Camper’s Paradise isn’t a raucous place, really, just a great place for kids of any age to enjoy semi-wilderness surrounded by a lake. It was voted Northern Minnesota’s Best Private Campground (northern MN) of 2014 by the Minneapolis Star Tribune. This site’s title photo was taken on the causeway to the island. Most of our vacation photos where taken there if you want to look around the island. The Monarch Butterflies came through a few years ago. It turns out that our house and yard are in their annual migration path. The year of 2007 was particularly spectacular for us. I have one photo and several video clips from various years. This one from 2012 turned out well. I also have vides from 2007, 2010, 2011#1, 2011#2 for those devoted to this. We’re newbies to this, but the activity in our backyard may eventually prove to be our learning ground. There were many more Monarchs than those shown in the small-screen images. My photographic skills don’t do them justice. 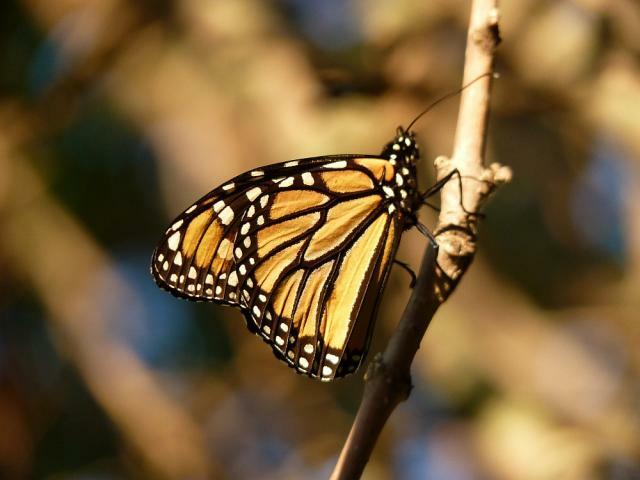 The Monarch population has dropped significantly in recent years. Various theories exist including loss of habitat, very cold winters at their roosting grounds in Mexico (the main destination of their multi-year migration) and the decrease in milkweed, one of their main sources of food, due to agricultural herbicides and roadside management. 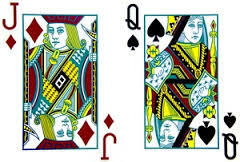 Here are rules for Six-Card “Racehorse” Pinochle and Eight-Card six-player “Racehorse” Pinochle. The “Minnesota Project” started June 2007 at Staples, MN. 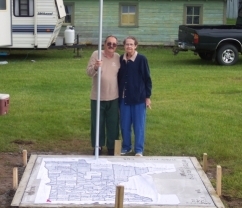 The project was spawned perhaps 20 years ago when my parents, Grace and Ken, started collecting rocks from Minnesota counties that they traveled through. 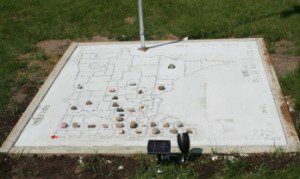 The project consisting of a concrete map of Minnesota with the counties outlined by placing galvanized nails head-by-head at the county lines. My brother-in-law, Bob, made the plans and printed the map so we could place the nails in the right places. My dad built the frame earlier in the week and on Saturday, June 2nd, 2007 we poured the cement, and in an hour of concentrated effort by us kids, grandkids and extended families, placed each nail to form the county lines. My mom placed the first nail, indicated by the red ribbon, at the southwest corner of the state. The next phase will include the formation of rivers and the epoxying of rocks collected from each county, to be place in their respective county locations on the map. One of my favorite comic strips by Peter Kuper. And here’s another one, relevant to people who play music in public. Another, relevant to people who play music in public.